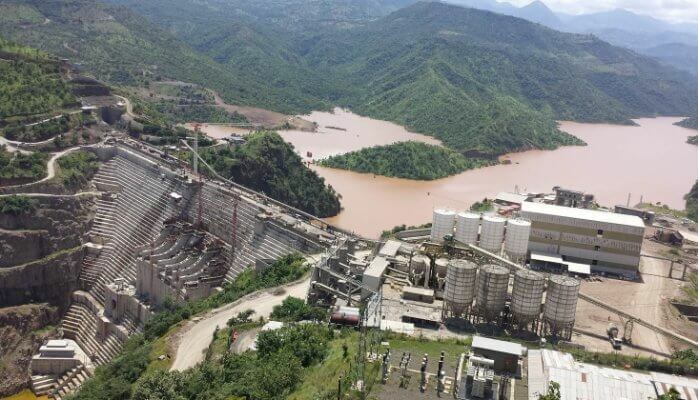 ADDIS ABABA, Ethiopia — Ethiopia on Saturday officially opened the Gibe 3 hydroelectric dam, which is among the biggest in Africa, despite concerns by environmentalists about its impact downstream and upon neighboring countries. Ethiopia aims to produce 15,000 megawatts of electricity through its dams in the coming five years, Prime Minister Hailemariam Desalegn said at a ceremony launching the Gibe 3 dam. Officials said Gibe 3 makes Ethiopia one of the biggest producers and consumers of renewable energy in Africa. They said the massive dam will help Ethiopia meet its own and neighboring countries’ increasing demands for cheap, renewable electricity. The Gibe 3 dam cost $1.7 billion to build, with 40 percent of that covered by the Ethiopian government while the remaining 60 percent was obtained through a loan from the Chinese government, officials said. Gibe 3 is part of the Ethiopian government’s efforts to build a series of dams on the Omo River, which runs into Lake Turkana in Kenya. Environmentalists say the dams could lead to livelihood losses and increased local conflicts. Ethiopia has abundant rainfall in the parts of the country that supply the dams with water to produce hydroelectricity. It is also now building the Grand Ethiopian Renaissance Dam, which has the capacity to produce more than 6,000 megawatts of electricity and will be Africa’s biggest hydroelectric plant. Ethiopia’s other infrastructure development projects are aimed at bringing in more foreign investment. This year Ethiopia launched a 756-kilometer (470-mile) electric railway from the capital, Addis Ababa to Djibouti’s main port. A year ago, the country completed Africa’s newest light railway transit system, which connects the four parts of Addis Ababa. Another railway system is being built across the country by a Turkish company as Ethiopia aspires to connect to more of its neighbors by rail. [A]s a plan it sounded much like a Sunday in Hampshire. So you can understand my concern when I saw the man holding a carrier bag full of old rope. Apart from Saudi-Ethiopian billionaire Mohammed Al-Amoudi, Samuel Tafesse is arguably the most popular businessman of Ethiopian origin. The BBC World Service has launched three websites for Ethiopia and neighbouring Eritrea as part of its biggest expansion since the 1940s. I have always questioned God’s existence, but in the northern Ethiopian town of Lalibela, I was presented with fairly substantial evidence. The e- visa is processed and issued online on a single Web page where applicants apply, pay and secure their entry visa online. Ethiopian Airlines was betting Airbus SE’s new A350 widebody would help it lure lucrative business-class passengers away from the likes of Emirates. . .
Pizza Hut is set to open three outlets in Ethiopia this year, becoming one of the first international restaurant chains to enter Africa’s second-most populous country. The Danakil Depression, including the Dallol volcanic area is one of the most remote, inhospitable and poorly studied areas in the world. The Embassy participated in the inauguration of the Ethiopian Airlines flight to Oslo on Friday 24 March 2017. Read the speech made by the ambassador below. The Caesarea-based firm is teaming up with partner TodayTomorrow Ventures Inc. in a $400,000 deal to construct a wastewater treatment facility at the EPRI 1 condominium complex in Addis Ababa. Gibe III Hydroelectric Project, Ethiopia […] is expected to be in full operation by August, 2016. .. Source: CNN Native to Ethiopia, the Ge’ez is more than just an ancient, nearly forgotten language. It’s Ethiopia’s link to its distant past. Copyright© 2019 Wanza Relocation. All rights reserved.